Welcome to the new site! It's come a long way from where I started, and though I still have more work to do, I thought I'd at least get what I've done so far up and running. Plenty of new work on here that most of you have never seen, and it's exciting for it to be in one place, after all these years. While I certainly plan to update this chronicle with a lot more stories, updates, and adventures, this will have to do for now. More to come soon, I promise. In the meantime, here are a few images I shot in Montana this past fall. Hope you enjoy! I’ve been a bourbon drinker for a while now, and despite being frequently asked about my impressions of bourbon country in Kentucky, up to this point I’ve had nothing to say. But the legend of that area travels far and wide, and rather than have someone else tell me about it, I wanted to see for myself. So on a frosty autumn morning in late October, I finally got that chance. 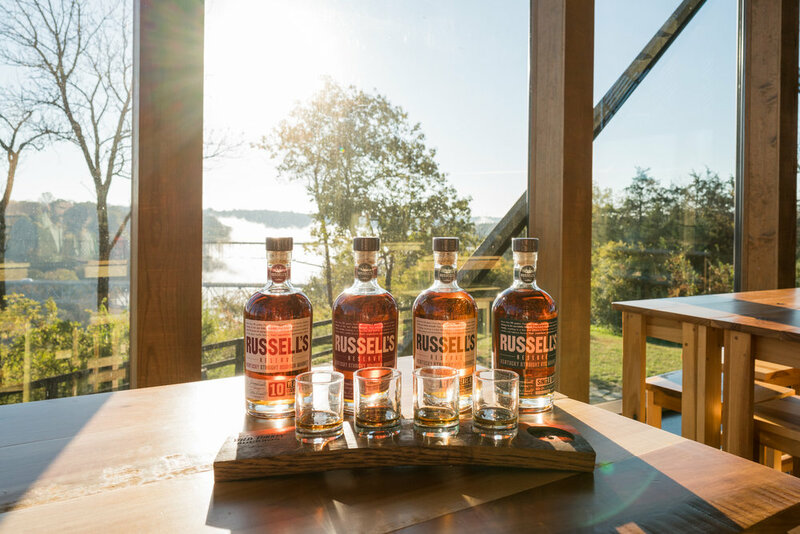 As I drove through the rolling hills and changing leaves, a thick fog enveloped the Kentucky River, creeping by in slow sheets, and heightening the drama of my entrance into Lawrenceburg, Kentucky, the home of Russell’s Reserve (and its parent brand Wild Turkey). Rounding the bend of an s-curve bridge, the fog cleared for a moment, and perched atop a wooded hill, I could see what looked to be a farmhouse roof/turned tasting room. Arriving at the Visitor Center, I was immediately greeted by a few women employees who felt more like aunts than strangers, and they told me to make myself at home. Lining an entire wall of the entry hallway was a collage of the visual history of this famous area, with photographs, old bottles, and even Prohibition documents that outlined the people, events, and products that helped shape this town into what it is. But one figure stands out amidst all of that multi- generational history — Jimmy Russell, the very man I was there to meet. Jimmy Russell is a living legend in the bourbon world, and apart from working here for 63 years, is a member of the Bourbon Hall of Fame, and is largely responsible for the return in popularity for this “true American spirit,” as he calls it. Getting the chance to not only meet him in person, but to sit down in his office for an interview was a really unique opportunity, and something I’ll never forget. We talked for over an hour about his love for making bourbon, the ups and downs of the business over the years, and why he insists on never changing the recipe for Russell’s Reserve. In his words, “If you’ve got something going good, you don’t fool with it.” Born and raised right there in Lawrenceburg, Jimmy still lives within a mile of his childhood home, and is continuing a family tradition of making bourbon, passed on by his father. One of his sons, Eddie, and his grandson Bruce, have followed in his footsteps. His granddaughter Joann works for the company as well. Starting the job in 1954, Jimmy says he’s never actually worked a day in his life, because he loves it so much. “The day it feels like work is the day I’ll retire.” And much to everyone’s delight, it doesn’t seem like that day will be anytime soon.As our conversation wound down, Jimmy had business elsewhere, in this case the Visitor Center, where he personally greets guests, takes photos with them, signs their purchased bottles, and insists that they call him “just Jimmy.” Both humble and wise, he’s the type of man we all can learn a thing or two from. Next, I met up with Eddie Russell, Jimmy’s son. Also a member of the Bourbon Hall of Fame, Eddie was the originator of the Russell’s Reserve line, creating the first batch in honor of his dad’s 45th anniversary at the company. Somehow, everyone managed to keep the true identity of the product from Jimmy, despite the frequent tasting sessions for feedback. It was only after the bourbon was bottled that Jimmy learned it was in his honor, and since then, it has become a family effort. The result being a superior bourbon that represents their combined distilling experience of nearly 100 years. Now a little bit wiser to the Russell family history, Eddie gave me a private tour, including the distillery, barrel aging houses, and surrounding grounds. Unlike most tours, I got to see behind all of the curtains, and open the doors that say “employees only.” Everybody there greeted each other by name, and it felt more like a family reunion than a major distillery. Folks genuinely care about the work they are doing there, and many are carrying on three or four generations of working there, the Russells included. One of the most interesting things by far was the barrel house, or “rickhouse,” as they call it in bourbon country, which has been standing since 1894. Full of aged, weathered wood, the late morning light filtered through dusty panes of glass that have stood the test of time. 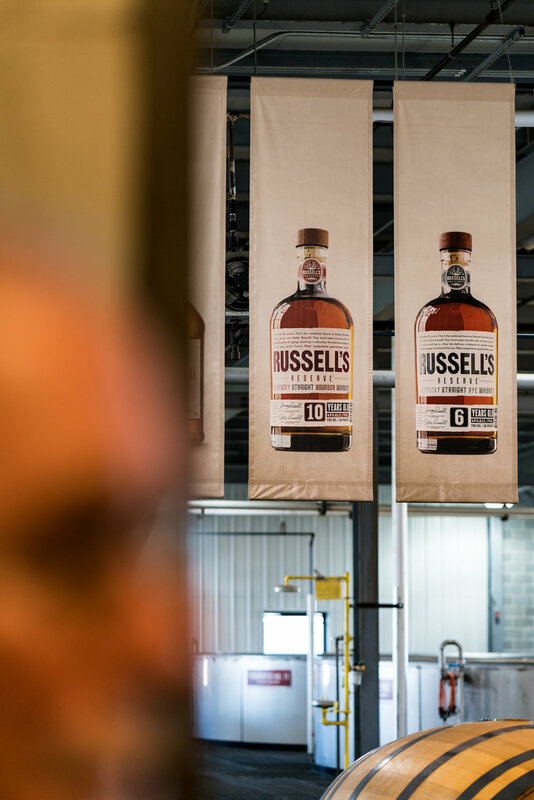 Contrasting with more modern, climate controlled barrel houses that other companies might use, the Russell’s prefer to keep things the way they’ve always been, and keep time honored traditions alive. It’s one of the coolest buildings I’ve ever seen, and I walked the halls in silence for quite some time, admiring the barrels yet to be bottled, all in various stages of their lives. As the day came to a close, we met back up with Jimmy, so that I could thank them both, and be on my way. Out of curiosity, I asked them both which of the Russell’s Reserve line was their favorite, and they both said the 10 year small batch bourbon, which is a testament to the quality. If two Bourbon Hall of Famers provide a recommendation, I’m sure going to follow it. And while there is always debate about how you should drink it, Jimmy was adamant that it should be enjoyed any way you want to. “The most important thing is that you slow down, enjoy the flavors, and the company of friends and family around you,” he told me. “I have one favorite cocktail though...I like to take one cube of ice, and flavor it with bourbon,” he added with a chuckle. It was a fitting note to end on — a lighthearted joke from a man who is ensuring his family legacy through dedication and hard work, and is still loving every minute of it. If you find yourself in Kentucky, make a point to stop by the Wild Turkey Distillery in Lawrenceburg – which is situated between Lexington and Louisville. I’m sure the Russells would love to meet you. This past fall, I had the pleasure of visiting the Diamond Cross Ranch in Moran, Wyoming, which is just a short ways outside of Jackson Hole. Historic through and through, this place is an absolute gem, and a true representation of what the west has to offer. The Golliher/Long family was kind enough to host us for a few days and as you can see, we came away with no shortage of quality imagery. Major thanks for my friend and fellow photographer Chris Douglas for the invitation, whose work is more than worth a look at. I certainly plan to return this fall during my annual respite in Montana, and re-visit the new friends I made here. If you're ever in the area, look them up, they offer horsemanship lessons that are hard to beat. Tecovas Boots has become one of my favorite clients, and by this point, are good friends. I've been very fortunate to work directly with the founder, Paul Hedrick, who has graciously trusted me to help pave a path for the brand he created. For this shoot, our fourth thus far, we headed out to West Texas. Drawing from the talents and resources of our friends over at West Pack, we managed to secure the Gage Hotel in Marathon as our home base. Over the course of three days, we shot in and around The Gage, Alpine, Big Bend, and Marfa, with some additional help from our pals over at El Cosmico. It was a fantastic shoot, and we were able to walk away with plenty of content for use across all of Tecovas' channels. Really looking forward to the next one, which we've already got in the works. Up to this point in my life, I had spent very little time in the Northeast, with only tales of hunts from friends, or books to paint a portrait of New England’s sporting traditions. It’s a bizarre concept to feel at home thousands of miles away on the African savannah, yet feel a stranger in my own land as I enter into New Hampshire for the first time. But in the the rolling hills and cold, clear streams of the Berkshire Mountains, I found a sportsman’s paradise. Encamped at the unofficial Ball and Buck cabin, a pastoral bastion in the Berkshires, I spent a few days surveying the woods, wildlife, local traditions, and of course, the beer. I find it important to be able to order the “right thing” at foreign watering holes if you’re to have any chance at befriending the keepers of local hunting knowledge. In this case, a friend and guide saved us from any extemporaneous interrogation, being both a turkey whisperer and trout slayer. The plan was simple enough; fill a turkey tag in the morning, and weigh down a trout net in the afternoon. A blast, then cast. But simple plans don’t always have simple endings, as all hunters know. We rose hours before dawn, layering in camouflaged garments of varying warmth and mobility to stave off the misty cold of the northern woods, and crept into the lessening blackness. Our first position was on the outskirts of a great sloped field, encircled by trees. 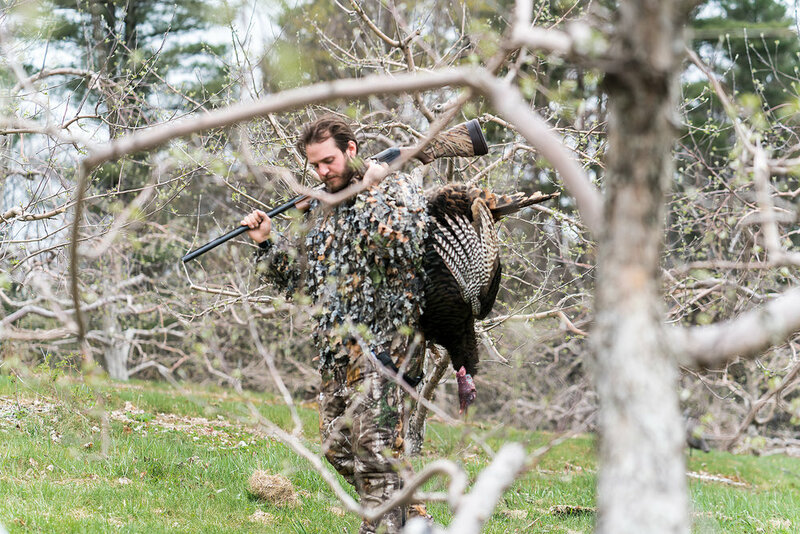 The decoys were carefully placed, and as light began to trickle through the still barren branches, our fowl lipped leader began to loose the calls. To me, there’s something slightly comedic about calling in turkeys, because if successful, these giant birds come angrily strutting out of the woods looking for a fight, a frolic with a female, or both. In this instance, no birds came, so we continued our search elsewhere, stopping occasionally on the edge of fields, woods, or farms to let out a few calls. And after a few hours of lonesome bellows, a tom finally answered on the outskirts of an apple orchard. We hurried into position, our backs to the freshly blossoming trees, and waited, though not very long because, as the saying goes, “they were comin’ in hot.” It wasn’t five minutes before three males came across the field at an aggressive pace, looking for a good old fashioned fight. But to their great surprise, they found us, and the pointed barrel of the Ruger x Ball and Buck shotgun, under which the largest of the three birds quickly fell. A beautiful specimen, we said a few words of thanks and congratulations, took a handful of photos, and were off to the boat ramp, where we cleaned and dressed the bird for a feast to follow. A change of gear was in order, and being that the new B&B spring line needed “field testing,” we gladly outfitted from head to toe, including the rods and reels. We were to float the Deerfield River, which wound through a canyon whose depth I did not know existed in New Hampshire. It was an incredibly beautiful landscape, riddle with diverse tree species, changing terrain, and unexpectedly, a healthy population of trout. We floated casually in and out of pools, riffles, and deep eddies, casting a variety of flies throughout the day, and managed to land quite a few fish. Metallic rainbows and vibrant brown trout, it was a testament to the hearty nature of these fish, with numbers far beyond what I expected from a stream so close to farms, roads, and “civilization.” But it just goes to show that you can’t assume until you’ve gone, and you don’t know until you do. The sun sinking, and the trout safely released back into their prospective homes, we loaded the raft on the trailer, packed everything up, and cracked a few cold ones to toast a successful slice of the good, sporting life. My previous notions happily dashed on the rocky banks of the Deerfield River, I left with aprofound sense of respect and admiration for this part of America that I knew very little about. Where frontiers may still exist in the West, it is very reassuring to see successful conservation at work in an area that has been colonized since the birth of our nation. Hope indeed for the future of hunting and fishing. It’s rare enough to still find wild enough places to hunt turkey and catch trout in the same day, let alone so close to major cities. It was a sporting experience I won’t soon forget, and I’ll be back soon, hopefully in time for the turkey feast. For Texas natives Kate & Julian Pastrana, the path that led to designing and shaping works of art from wood had very humble, and homely, beginnings. “When we first got married, we couldn’t afford any quality furniture for our house, so we just decided to start building it ourselves,” Julian told me in his soft spoken, genuine demeanor. And build it they did. Part farmhouse, part furniture showroom, their home on the rural outskirts of Denton, Texas is an ever-evolving canvas of the couple’s creativity, and sense of design. Bar stools, serving boards, tables of various sizes, and prototype chairs populate their country home, which acts as both drawing board and proving ground. “The advantage of building things for ourselves first is that we get to make sure it works. We sit on the bar stools, eat off the serving boards, and break in the tables. It has to work in our home before it can be in anyone else’s,” Kate told me as we sipped coffee on their screened in porch (which they also built). With hints of improvement projects around every corner, including custom woodwork on the walls, their abode is a testament to a philosophy of function. Operating out of their adjacent garage turned workshop, the couple collaborates on the process from start to finish; from home improvement idea, to polished product. This also allows them to spend more time together on Julian’s days off from being a full time firefighter and EMT. And though they both have creative backgrounds, neither of them had any woodworking experience prior to this endeavor. In a world dominated by single servings and furniture built by number, the Pastranas are hand making products that will stand the test of time, grow in beauty, and hopefully be passed on as family heirlooms. 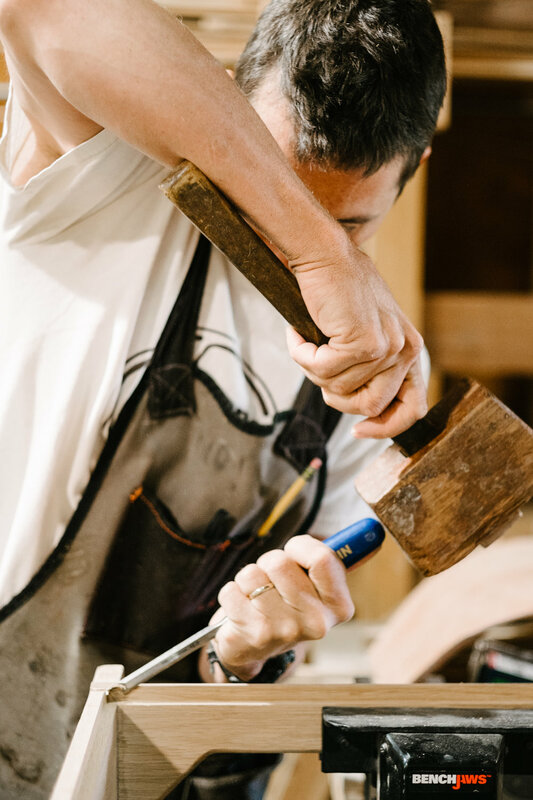 Though it is their business, the fact that it remains a creative outlet for home improvement, ensures the authenticity and virtue in their aims; they want to create beautiful things that will work, and last. “It’s a passion for us, and something we will continue to do regardless of whether people buy anything or not,” Kate remarked, fighting a smile off that revealed just how happy and whole she feels doing this work. 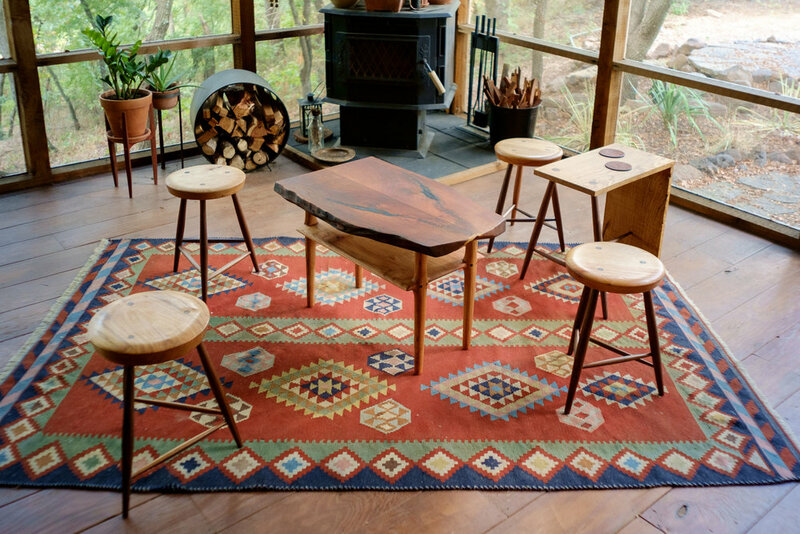 “That’s the difference between being JUST a woodworker, or being an artist…it’s not just about function, but about the desire to create something beautiful.” And those creations are being collected left and right by loyal customers, friends, and design aficionados, especially in Texas. “We’ve been in business just over a year, and the response has been amazing. There is such a supportive community here in Denton, and the encouragement of other artists and peers has pushed us, and kept us going. Thankfully the growth has been very manageable, as it’s just the two of us filling orders,” Julian was happy to report. While most of their business has come from online orders, success at recent pop-up shops has allowed them to branch into some larger, one-of-a-kind pieces for clients who wanted custom work, as well as several concept restaurants in the North Texas. Other times it’s just a friend who needs something specific for their house. “We let the wood speak for itself, and try not to cover up the natural grains. We also don’t do a lot of raw edge work, so it isn’t very rustic, but can still fit into that aesthetic mix in someone’s home because of the natural woods,” Julian said of their style. With the resurgence of the maker movement in recent years, people are once again learning to appreciate quality over quantity, which often requires an investment towards a marginally higher price tag. High caliber is becoming more popular, which is good news for the hard working folks behind Pastrana Studio. But regardless of changing times and trends, Kate & Julian will continue to craft wares that not only suit their lifestyle, but many of the ones yet to come. With a dedication to simple function, quality craftsmanship, and timeless design, this quiet couple behind Pastrana Studio is at the very pulse of what the maker movement is all about.